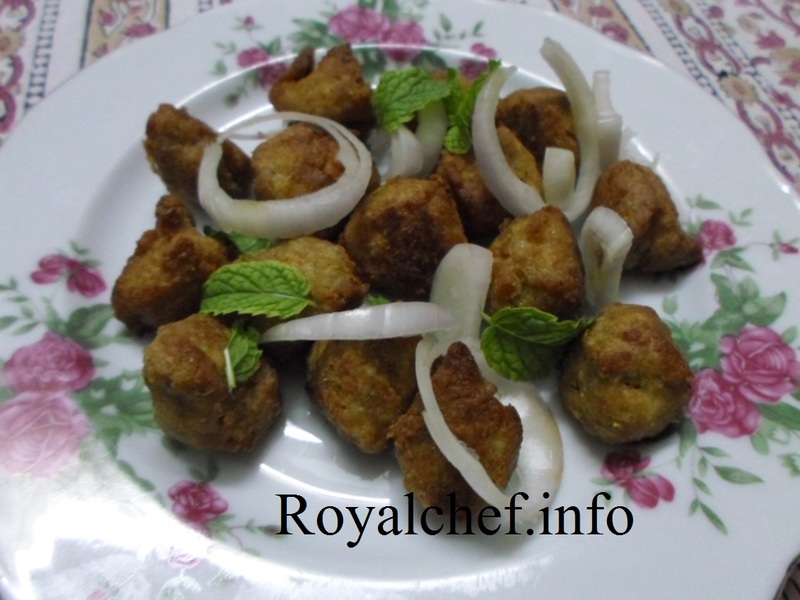 This is a Recipe for Kashmiri Style Mutton Kebab, a specialty Meat preparation from Kashmir. I have prepared this Kebab, using the traditional Kashmiri method. The Kebab goes nicely with the main course or as a starters item, can also be served for Kitty and Cocktail parties. Also given here is the Marathi version of the same recipe for the benefit of Maharashtrian readers. Remove bones from the Mutton, cut into 1” pieces, and then keep them in the refrigerator for 30 minutes. Then grind the Mutton pieces, Onion, Green Chilies, Ginger, Red Chili Powder, Cumin Seeds Powder, Pepper Corn, and Salt into a Paste. Remove the mixture from the grinder and add the beaten Egg, mix it well and prepare small balls and keep them aside. Heat the Oil in a Kadai and deep fry the balls until color changes into light brown. Garnish with Mint Leaves and Onion. Serve hot. साहित्य :– ५०० ग्राम मटण, २ कांदा (चिरून) , ४ हिरव्या मिरच्या (मोठे तुकडे करून), १ १/२” आले, १ अंडे, १ टे स्पून लाल मिरची पावडर, १ टे स्पून जिरे पावडर ( भाजुन), ७-८ मिरे, मीठ, तेल कबाब तळण्यासाठी. कृती : मटणातील हाडे बाजूला काढून मग मटणाचे १” चे तुकडे करून घ्या व १/२ तास फ्रीजमध्ये ठेवा. नंतर मटणाचे तुकडे, कांदा, हिरवी मिरची, आले, लाल मिरची पावडर, जिरे, मीठ व मिरे बारीक वाटून घ्या. मिक्सर मधून काढून त्यामध्ये फेटलेले अंडे मिक्स करून घ्या व त्याचे छोटे-छोटे गोळे बनवून घ्या. एका जाड बुडाच्या भांड्यात ३-४ कप पाणी गरम करून त्यामध्ये गोळे घालून मंद विस्तवावर १५ मिनिट परंत शिजवून घ्या. कढई मध्ये तेल गरम करून त्यामध्ये शिजवलेले गोळे गुलाबी रंगावर टाळून घ्या. गरम गरम सर्व्ह करा.